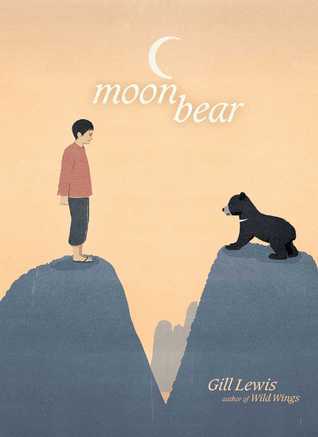 Moon Bear by Gill Lewis. Grades 4-7. Atheneum Books for Young Readers, March 2015. 384 pages. Reviewed from ARC provided by publisher. When Tam's family is forced to move from their mountain home in Laos to a village in the lowlands, they are told that they will have a better life. They will have schools and doctors and electricity. But almost immediately, Tam finds himself having to travel to the city to work and send money home to his family. He's given work at a bear farm, a place where bears are kept in tiny cages and "milked" for their bile, a substance that is used in traditional Chinese medicine. As Tam begins to care for the bears and realizes what a terrible situation they're in, he knows he needs to do something. But what can one boy from the mountains do to make a difference? This was a hard book to read sometimes, but it's an important story and I'm glad I did read it. I was interested in the details about Tam's life in Laos, both in his mountain home and in the city. We see how the people in charge casually manipulate those beneath them. Bombs left over from the Vietnam War are still scattered in the fields, the people with money and power easily cheat those with nothing. But one person can still make a difference and even small differences can lead to real change. This book brings to light several issues of which young readers may not be aware, including the treatment of village populations when Progress wants to make its way through their home and, of course, the farming of bears for bile. I think this is a title that will particularly interest young activists and those wanting to know more about political and environmental issues in the world around them. Tam, a child with no power to change the fate of his family and fellow villagers, chooses to make a difference where he can: speaking up for the bears who have even less of a voice than he does. Gatekeepers should be aware that there are some scenes depicting the treatment of the bears that might be upsetting to sensitive readers, particularly animal lovers. It's nothing that feels out of place in the story, but just be aware. Tiger Boy by Mitali Perkins is another story about a boy choosing to make a difference for endangered animals (be aware that Tiger Boy is a bit of a gentler story). The Red Pencil by Andrea Davis Pinkney. This book also features a child caught up in the political issues of her country, affected by war, and trying to figure out how to make her way in an unfair world. Shiloh by Phyllis Reynolds Naylor. This book also features a child who loves animals and is willing to face scary adults to do what's best for the animal he loves.